Dmitry Beylaev was born July 17th, 1917. Dmitry and his older brother Nikolay studied molecular genectics in the time of the Soviet Union, when genetic research was tabooed. They believed that domestication was based on tame genes in an animal, and wanted to replicate the domestication of wolves to dogs, using Silver Foxes, native to Russia. As a result, Nikolay was sent to a labor camp where he eventualy died, and Dmitry lost his job at the Department of Fur Animal Breeding in Moscow. However, Belyaev continued his research secretly, disguising it as animal physiology. His research was moved to Novosibirsk, Siberia in 1959, when Belyaev founded the Institute of Cytology and Genetics of the Siberian Branch of Russian Academy of Sciences, or IC&G for short. IC&G has continued to selectively breed Silver Foxes, with surprisingly positive results and side surprises. Dmitry Belyaev died of cancer on November 14, 1985, but his research still lives on. Lyudmila Trut now leads the genetic research of domestication in Siberia, with the help of Anna Kukekova. If you were to gain access to a lion cub, you may be able to raise it to be friendly towards humans and other animals. But, that lion's offspring would be as aggressive as it's wild African ancestors if not tamed in it's early years. Also, there is still a slim chance that your own tamed lion could attack. It's still a wild animal, no matter what. Your lion would be considered a tame animal. Domestication, on the other hand, is a slow process in which each generation of an animal grows closer to humankind, a trait that Belyaev believed was written in the creatures' genes. 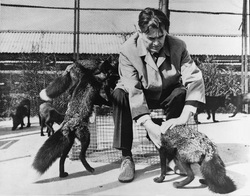 When first hearing of the Domesticated Silver Foxes in Siberia, many people believe that the foxes are simply being tamed, then bred, then sold to giddy children in the US, who in turn get rabies from their wild pet. This is not true. The foxes are chosen to breed according to their natural friendliness, a trait that would be present in the foxes if they were tamed or not. In turn, each generation becomes friendlier and friendlier, creating a domesticated species.